“Water, water every where and not a drop to drink”. Did any of you study the Rime of the Ancient Mariner in High School? The poet, S.T. Coleridge, describes thirsty sailors who are parched at sea under the hot sun and cannot drink from the limitless salty ocean that surrounds them everywhere. Although this phrase from the Ancient Mariner is not quite accurate for the State of South Australia, it is still a pretty good description to describe the state’s need for water to sustain its economy and people, while at the same time being predominantly land-locked by a vast desert landscape, commonly referred to as the “Outback”. South Australia’s mainland coastline is approximately 3800 km long (i.e., water everywhere), yet four-fifths of the state receives less than 250 mm of rain (i.e., not a drop to drink). By definition, an area that receives less than 250 mm (10 inches) of rain per year is termed a “Desert”. Therefore, four-fifths of the state is desert. Water for human use is scarce and a highly valued resource. Everyone we have met so far who lives in South Australia has an opinion about water use and conservation. 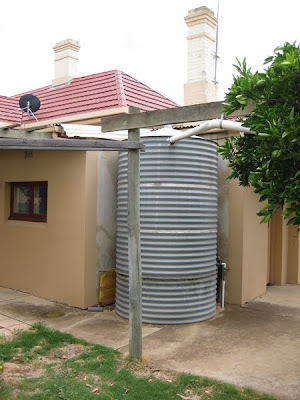 We have frequently been told that we “live in the driest state in the driest continent”. South Australians have told us that the state has gone through 10 – 12 years of drought, reduced crop yields, and bush fires. People are wondering if this prolonged drought is temporary or a harbinger of long term climate change. Kadina only receives 338 mm (15 inches) of rain per year; yet it is only 8 km away from the Ocean. Prior to arriving in Kadina, we wondered how a community located so close to the ocean could receive such a limited amount of rainfall. The answer, we found, is dictated by the prevailing winds. South Australia’s climate is dominated by pressure systems which pass over the state from west to east. One only has to look at a map of Australia to see that the prevailing winds travelling west move across an extensive land mass. By the time the winds reach South Australia, there is little moisture remaining in the clouds. 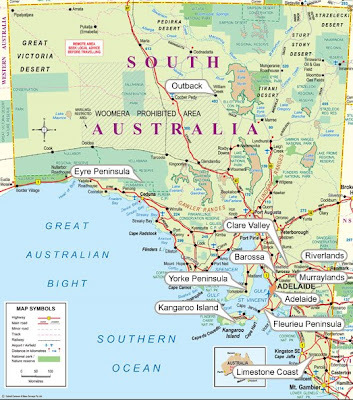 As shown in the attached figure, Spencer's Gulf is located to the west of the Yorke Peninsula. During summer, the wind blows off the continent and has very little ocean mass (Spencer's Gulf) to pick up any moisture before reaching the Yorke Peninsula. Hence the reason for Kadina’s low rainfall in an area located so close to the ocean. Also during the summer, high pressure cells may remain stationary over the state for long periods of time, bringing clear, sunny days and often heat wave conditions. This, no doubt, explains why we experienced a temperature of +43OC upon our arrival in Kadina. We had arrived in the middle of another summer heat wave. As one travels to the tip of mainland South Australia, rainfall increases since the prevailing winds cross the Australian Bight and travel primarily over the ocean. Therefore these winds are not as greatly influenced by the continental land mass. This is reflected in substantially more rainfall along the coast. For example, Mt. Gambier’s annual rainfall of approximately 700 mm is almost double that of Kadina. In the winter, the winds are reversed and originate predominantly, across the ocean, from the south west. As a result, the Yorke Peninsula receives sufficient moisture to be one of South Australia’s great grain growing areas. These same moisture laden winds travel further north – northeast of Adelaide to the Adelaide Hills and Mt. Lofty Range. As the clouds rise in elevation, they provide much needed water to two of South Australia’s famous wine growing regions in the Claire and Barossa Valleys. These Valleys enjoy a Mediterranean climate with dry hot summers and cool wet winters. (More on South Australia’s Wine in a later blog). A fundamental ecological principle for managing land use is: Vegetation and Soils are a function of geology, relief, organisms, time, and climate. Simply stated, vegetation and soils on the landscape are not inert and stable but develop under the influence of a number of determining factors such as climate. In 1865 George Goyder, the Surveyor General for South Australia, put this ecological principle to good use. 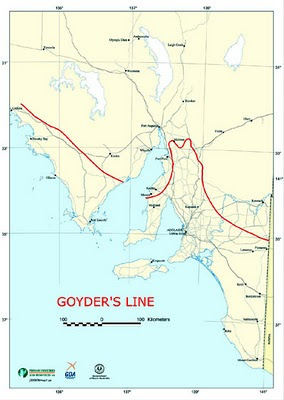 Goyder identified a boundary line, based on vegetation, across South Australia. To the north of the line salt-bush is dominant and to the south of the line - gum trees. Goyder discouraged farmers from planting crops north of the line as he believed that agricultural practices would prove to be marginal. Wittingly, Goyder’s Line represents the demarcation of South Australia’s Outback since it basically follows the annual rainfall average of 250 mm (10 inches). Also of interest, and as should be expected, most of South Australia’s population is presently located below Goyder’s line. Fourth-fifths of the state’s land mass is Outback. Communities within the Outback are sparse and are centered near mineral resource extraction developments. A Dingo (Australian Wild Dog) Fence has been constructed to protect sheep flocks by containing Dingo’s within the arid desert areas. This fence serves as a further reminder segregating the fertile agricultural lands from the dry arid Outback. Unlike Canadians, Australians identify River Systems using the word “River” first. Hence Australians would call the North Saskatchewan River the “River North Saskatchewan”. The Murray River is Australia’s largest river and spans three states: New South Wales, Victoria and South Australia. Millions of people rely on the Murray River as a source of water for domestic use. It also plays a significant part in Australia’s economy as it is used for irrigation, livestock and industrial purposes. The River Basin provides a continual bounty of produce and is sometimes referred to as the “Food Bowl of Australia”. Consequently the river is highly regulated to control water quality and quantity. The river has 4 major dams, 16 storage weirs and 15 navigable locks. South Australia relies heavily on water from the Murray. Typically, the River supplies about 40% of the State’s urban water needs. During drought years, water use can increase to as much as 90%. 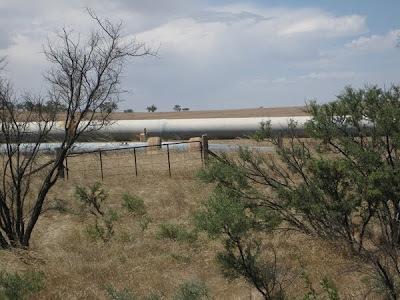 As we drive throughout South Australia, we can not help but notice a number of water pipelines of varying sizes accompanied by their respective pumping stations. The scarcity of water in the state has made it necessary to depend upon water transported over long distances in pipelines. 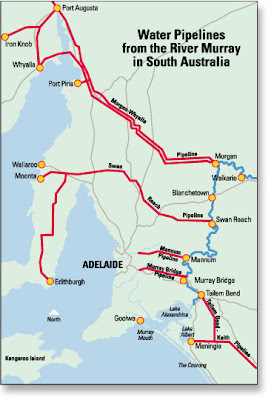 For example, the line between Morgan and Whyalla is approximately 400 km in length. The attached Figure illustrates the importance of the river system to supplying much needed water throughout the state. Water management for the Murray River is legislated by the federal government as well as the three states. Water use allocations, expanding populations, industrial requirements, recreational pursuits, poor water quality due to increases in salinity and recent droughts have put a strain on the system; with the Murray River Basin becoming a political issue for both federal and state governments. Water desalination plants are an alterative with a few plants currently in use; however, they are costly and big consumers of energy. The expression “Liquor is for drinkin’ and water is for fightin’” appears to have a whole new meaning here. Alberta’s water issues and over use allocations in the more arid parts of southern Alberta pale in comparison to the Murray River’s water issues. No trees, either on public or private land can be cut down without prior government approval. These water restrictions clearly make us realize how fortunate and thankful we are to have such abundant supplies of water in Canada. Water is something that we generally take for granted and think little about and often waste. With respect to desert environments, Canada has a vast uninhabited desert which is part of the Arctic. Climatic conditions are such that explorations of our mineral resources are yet to be fully revealed. The only inhabited desert skirts the Canadian border at Osoyoos, B.C. Like some of the desert areas of South Australia, irrigation has made much of the land around Osoyoos a very fertile area. An excellent blog Rick and Gail. It is refreshing to see, read, your thoughts and appreciation of a part of Australia most beloved and one I not only hold dearly, but know well. Yet there is always so much more to know. I'd like to read more of your emotional responses to the Centralian arid zone and deserts. For me they are always fresh, clean, revitalising in a way that can never be compared with anything along the endless coastline. The people too are exceptional from along the Old Strzlecki Track through Maree and up through Oodnadatta direct to Birdsville and north, or westward to Mt Dare and then to the Top End and around toe the Kimberley. Thank you for making the journey and recording it so well in your chronicle.